This entry was posted in Faith in Flash Fiction and tagged Flash Fiction, Forgiveness by Xochi E. Dixon. Bookmark the permalink. Love this story! reminds me of how many times we must forgive each other on a daily basis. Thanks from the bottom of my heart. You are an amazing writer! Thank you for your kind words, Cendy. You are so right about our need to forgive daily. 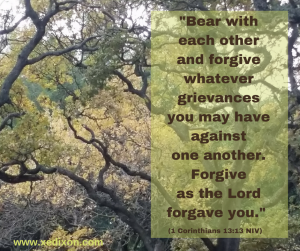 Forgiveness is an ongoing commitment to obedience and love. I appreciate you taking time to read my work and for blessing me with encouragement. I pray God will continue to help us forgive as we have been forgiven, Sister.